mourn our stellar cousins, whoever or whatever beings they were. For at the last, they have dared to destroy themselves and look into the unveiled face of Ultimate Truth. . . . .. . . . . . . . "So far as we know, our solar system is alone among inhabited universes. And we have our own final duty to face. In a few moments, the observatory will be deluged by inquiries. The public will demand to know what has happened. And why. And we will have to tell them. 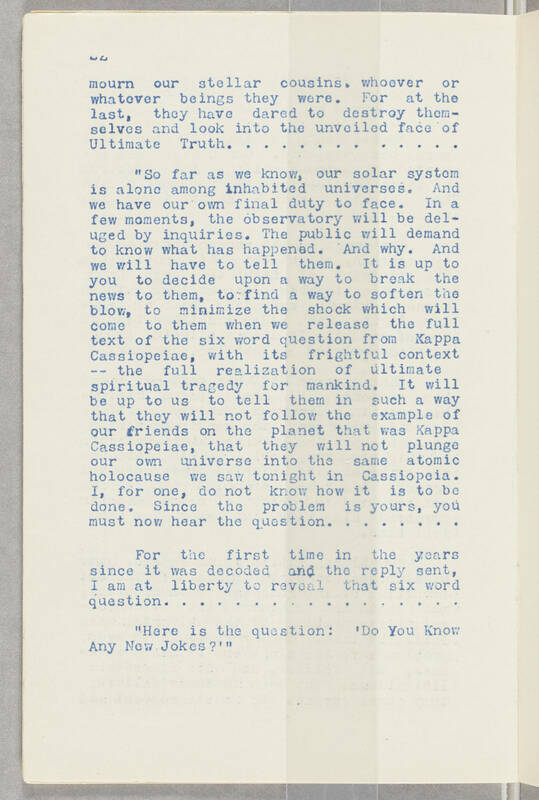 It is up to you to decide upon a way to break the news to them, to find a way to soften the blow, to minimize the shock which will come to them when we release the full text of the six word question from Kappa Cassiopeiae, with its frightful context -- the full realization of ultimate spiritual tragedy for mankind. It will be up to us to tell them in such a way that they will not follow the example of our friends on the planet that was Kappan Cassiopeiae, that they will not plunge our own universe into the same atomic holocause we saw tonight in Cassiopeia. I, for one, do not know how it is to be done. Since the problem is yours, you must now hear the question. . . . . . . . For the first time in the years since it was decoded and the reply sent, I am at liberty to reveal that six word question. . . . . . . . . . . . . . . . . "Here is the question: 'Do You Know Any New Jokes?'"